Two Elizabethtown police officers moved into new positions recently and were recognized at Borough Council's meeting on Sept. 20. 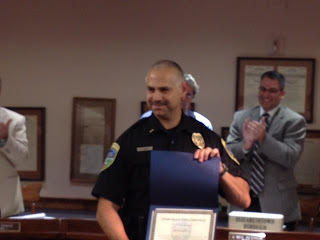 As I wrote about previously, Detective John Emerick was promoted to lieutenant. He will be replacing Lt. Joe Ditzler, who is retiring in a couple of months. Emerick joined the department in 1991 and was appointed to detective in 2006. With his promotion, that left one detective position open. At the meeting last week, police Chief Jack Mentzer announced that Officer Shane Deardorff was appointed to the post. He joined the police department as a part-time officer in 1998 and was hired full time in 1999. 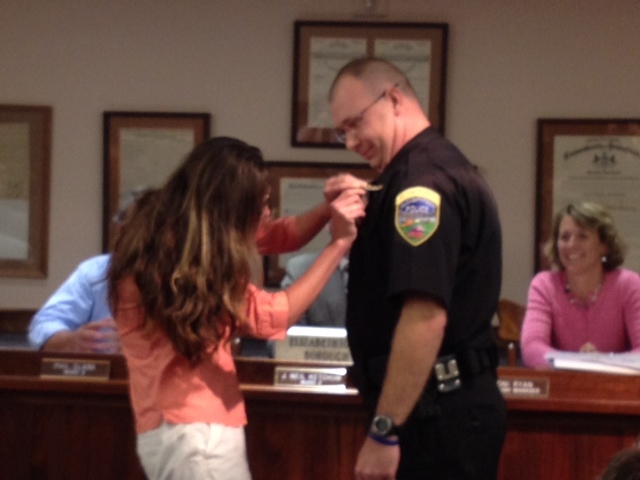 Detective Shane Deardorff's wife pins his new badge on him. Until his appointment as detective, Deardorff coordinated and organized the Field Training Officer program for the department. This is an exhaustive program that trains newly hired police officers one on one for 8 to 16 weeks. It teaches the new employee about all the details of being a police officer and everything that is expected of him or her, including talking on the police radio, learning the names of the borough's streets and learning how to handle all situations a police officer might encounter. Mentzer said Deardorff has done an outstanding job turning the program into a model. Having trained three new police officers recently, Deardorff was recognized as the departments Officer of the Year for 2011, the second time he had received the award. In October 2000, he received a Commendation of Merit for outstanding police work when he arrested a drug dealer who had a half-pound of marijuana hidden in a Doritos bag. In June 2002, he received a Distinguished Unit Citation for assisting with the investigation of a missing 1-year-old child, which turned into a murder investigation. His assistance led to the arrest and conviction of the child's mother. In June 2003, he received a Distinguished Unit Citation for assisting with a felony traffic stop of four burglary suspects. When two of the suspects fled, Deardorff assisted in securing two of the suspects and directly contributed to three of the felons being incarcerated. The suspects had committed burglaries in Lancaster and York counties. These are just are highlights of the achievements that Deardorff had had in his career in Elizabethtown. I think I can speak for my fellow borough councillors that we are grateful for the commitment and dedication of our police officers. Our community is fortunate to have a great department that has produced Emerick and Deardorff. If you see them on the streets in coming days and weeks, offer your congratulations.